Creative morning! Woke up with the idea to must do a new postcard for our guests this sumeer. 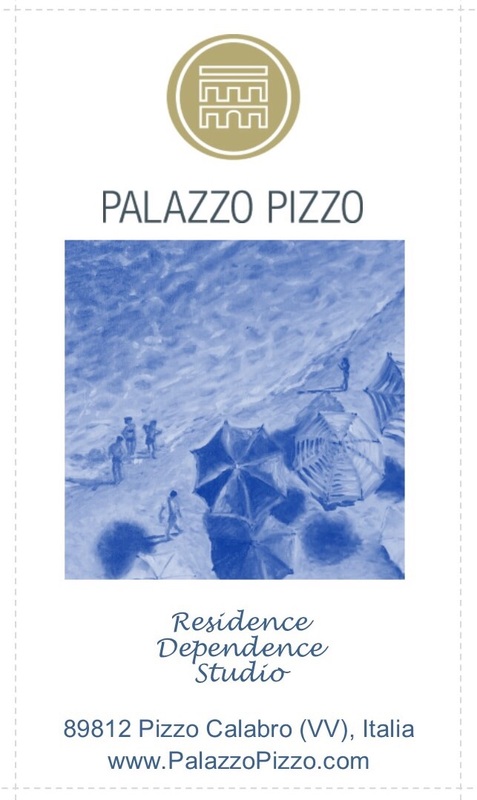 Since we are going to have the new vacation rentals in a different house in Pizzo's centro storico, we need neutral cards. I used different tools. On my smart phone I used the app 'Pic Collage' but then turned to my computer where I have better resolution photos and used 'Publisher'. Funnily, I then emailed the result in JPEG format to myself, opened it on my phone and edited (exposure, contrast, and crop to a postcard format). For my previous postcards I have used also the free software 'PicMonkey' at PicMonkey.com. 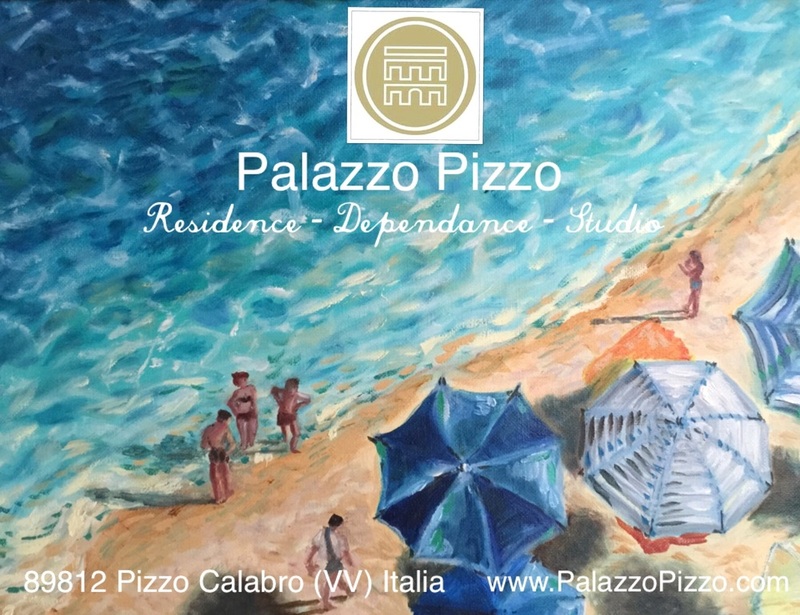 BTW, my new postcard is based on my oil painting which is based on a photograph of a beach, most likely between Pizzo and Tropea. Home staging is the art of styling and presenting a property - mainly to improve its appearance for potential buyers. In the U.S., almost an entire professional branch has emerged from 'home staging to sell'. And it works. So why not stage your holiday rental to 'sell' it to vacationer? Take great photos and advertise them online. The first impression counts! Of course you do not have to hire a professional stager when you have some sense for aesthetics and interior, and are able to handle a camera. It can be as simple as placing a vase with fresh flowers on the table or a bottle of wine and 2 glasses. Although professionals staging can even include a complete redecoration and repaint of the entire home before dressing it up with some magic touch. How much you want or need to invest in your vacation rental to make it look more appealing depends on your budget, the actual condition of your property and the price you will be able to achieve in your area. The residence we are letting is over 200 years old. It used to be a storage space for olive oil and hand made soap and only had only an earthy ground and stone walls and ceilings. It was more than a renovation. We made it livable. After insulating walls and laying a floor, we furnished the residence with modern and antique items, and decorated it. We bought some pieces of local art work to hang on the walls. Over time I had taken many photos. Some were nice. But some photos I took just looked lifeless, without a soul. A good friend of mine told me "'Stage it!". And further elaborated for me (coming from an undeveloped country in that matter), "Put some lemons next to the sink". She had lived long enough in the States knowing 'unstaged' - or even worse - empty property does not sell as people can less envision themselves at home. "put some lemons next to the sink!" There is no difference with vacation rentals. Imagine a yourself planning a romantic get away in the South of Italy, looking at some holiday lettings' websites. What do you see? What does trigger your decision? - Photos and reviews. - And it is all connected. If a place is well decorated, it will not only look good in your visitors' eyes, and possibly lead to positive reviews, you will also be able to take good photos. And even attract more visitors with even better photos after some additional staging. But keep your staging fair and real. You can stage flowers or fruits and assume guests would not necessarily expect exactly those in a holiday home. But you cannot stage crystal glasses when in reality guests will find plastic glasses in your kitchen. Or a beautiful umbrella in the garden when you don't provide one. Let's get started. Prepare a camera you are familiar with. It can be set on autofocus, with a standard lens, or even a smartphone. Make sure you get most of the space of a room into the picture, but also take some close up details. Always try different angles and heights. Ideally use some photo editing software or smart phone app afterwards to adjust the lighting of the indoor shots, crop or sharpen if necessary. I know, this is so evident, so basic. But it goes beyond the daily routine. Weather you are renting your entire home with private photos and books, or a separate room or residence just for guests, it needs to be perfectly cleaned before a photo shoot. The faucets in the bathroom and kitchen should shine! But there is more. If you rent your private home, you will probably have it already de-cluttered to the max to allow guests to feel comfortable. Your collection of regional pottery will ad charm, your blurred snap shots of your childhood might not. As said above, staging can be simple. Get fresh flowers from your garden, or single branches from a tree with decorative leaves or blossoms from your street. Otherwise buy them from the local market or flower shop. Try to reflect the flair of the location and the spirit of your home. For a Mediterranean home purple Bougainvillea branches or white Callas are more typical than tulips or orchids. I bought some beautiful Agapanthus flowers and placed the pots in the garden - they remained of course after the photo shoot. A bottle of wine, wine glass, cork and flower from the garden - together with a retro lace table clothes from the local market - a beautiful staging! (Next time, I would maybe add part of a chair). Did you invest in large and soft towels for your guests? Show them in your photos. Fold the toilet paper like the room maid does in hotels. Close the toilet lid. If you offer shampoo and shower gel or spa style hand soap, show them in your photo. Take pictures, with all lights on, from different angles, then shoot details: fluffy towels with the amenities in the background; your beautiful tiles or a fancy hook. Hang a straw hat on the hook or place it on the window sill. "Put some lemons next to the sink" if your vacation rental is in Southern Italy. Or some tomatoes or oranges. Choose a contrast to your kitchen colour. Show details of the coffee machine or fridge, if they are vintage or of any interest. Put all you have to offer on the table. Tablecloths, plates, glasses, cutlery, candles, napkins. Vacationer will envision themselves having lunch or dinner in your place. Take the lunch photo during lunch time and the dinner photo with candles lit on when its dark outside. (You might even notice during your photo shoot that something is missing in your property. Maybe not enough light to see the food on the plate? Or the light bulb is too bright for a romantic atmosphere?). Sometimes two glasses and a bottle of wine are also enough to present, especially when you expect the guest to eat at restaurants. The bed cover should match the flair of the location (get it from the local market). The bed can be made in two ways: 1) cover all with the bed cover (this is functional) or 2) fold the bed cover back and cover it with the linen and show the pillow with pillow cases (this looks inviting and homey). For the pillow cases you can choose a good quality. Iron it well as wrinkles would show in the photo. Adjust the bed cover and pillows as long until they look in perfect harmony, then shoot. Switch on the bed side table lamps and shoot again. Try different atmospheres, with lights on and out during day light and at night with all lamps on. Take a photo that shows the wardrobe, or part of it (as that is an information for the guest). Place the straw hat (if not yet used for the bathroom) on a chair. Take photos right before your guests arrive, present the pillows in crisp white bed linens and give it an inviting look. This detailed photo shows the Madonna del Carmine of the church next to our house. It adds some local spirit, some positive sign - and it shows, we have a night stand and a reading lamp. If the flowers are in full bloom, shoot. If not, get interesting plants in the foreground or part of branches hanging into the photo. Get details from the olive tree or the garden bench. Buy a flower or plant pot from the local market to stage where there is a gab. Create depth in field (with low f-stop for a blurry background - or use a smart phone app like camera +). Get the view, get the view from inside out and from outside in. Find the best perspectives. And place garden table and chairs. Use table cloths. Stage the wine bottle and the glasses. Shoot the deck chair with a book - or a straw hat. If you provide an umbrella, open it and shoot the sun and shadow effects. One of my usual garden shots: the place is so serene and the view so awesome... that I totally forget the staging! If you have outdoor furniture use them for your photos where and how your guest will! Even if that area is not the most interesting and some websites limit your advertising to 24 photos, you might want to provide the information to potential renters what they expect here. You might need to provide the stairs in a whole. Place a basket or straw beach bag on the stairs. For vacation home renters, the neighbourhood they will be calling home for some days is also of interest. Take a photo from some detail at your door. The old letter box or bell knob with part of the street. Her again you could add a flower pot, a welcome sign, bicycles (if guests can use or rent them), or your old Vespa for adding some flair. I see very seldom a person in a vacation rental advertising. But why not? Most hotels have people in their ads. If you rent to couples, chose a couple among your friends that is around the age of your target group or your most frequent age group. If you target families, let some kids play on the floor with some toys you provide. If you allow pets, stage with a dog. The people should not look into the camera to keep it neutral and not look like a personal holiday snap shot. First tryout: I think, a second person (a man) standing on the left side at the railing and watching the see while looking slightly to the right (into the picture) would have been perfect, since our target group are couples. My guest did some staging for me ! Palazzo Pizzo Residence is ready to welcome spring breakers! If not for yourself, maybe you have friends who plan a spring break in Italy. Palazzo Pizzo Residence is the perfect place to relax in Southern Italy. Beautifully located on the "Costa degli Dei", the Coast of Gods, between Amalfi and Sicily, it's only a 25 min drive from international airport Lamezia Terme (SUF). There are many direct flights from European cities and several daily direct flights from various Italian airports to Lamezia Terme. Other airports in the area are Reggio Calabria (1,5 h drive), Catania (Sicily, 2,5 h drive) and Naples (4 h drive). Pizzo in Spring - the Beach is waiting for you! 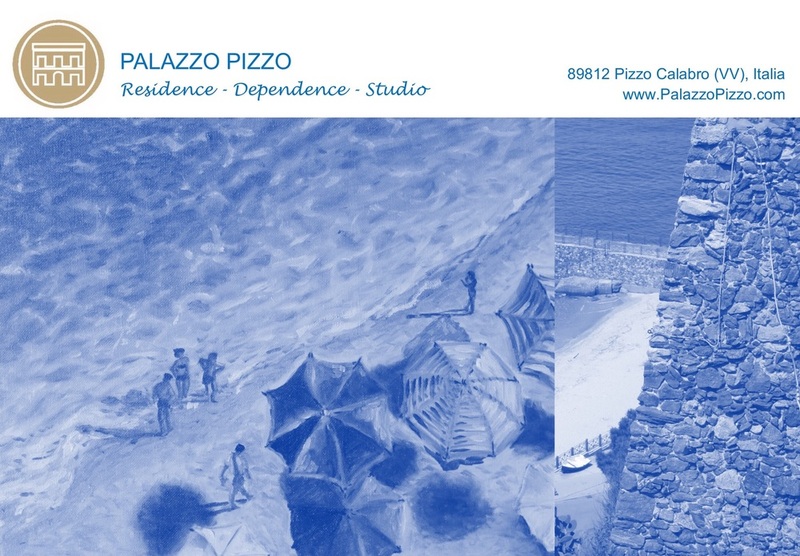 Check out Palazzo Pizzo Residence's website for further information, visit the photo gallery, read about our trip to Pizzo in April, or contact us at PalazzoPizzo@gmail.com. We are happy to help planning your vacation. We love to host you!